Got a stress case in your life? Of course you do: "Without question, many of us have mastered the neurotic art of spending much of our lives worrying about a variety of things all at once." Carlson's cheerful book aims to make us stop and smell--if not roses--whatever is sitting in front of our noses. 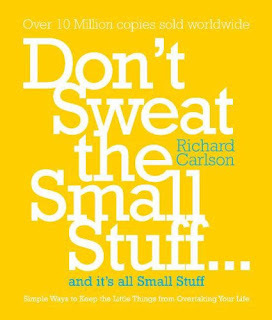 Don't Sweat the Small Stuff... offers 100 meditations designed to make you appreciate being alive, keep your emotions (especially anger and dissatisfaction) in proper perspective, and cherish other people as the unique miracles they are. It's an owner's manual of the heart, and if you follow the directions, you will be a happier, more harmonious person. Like Stairmasters, oat bran, and other things that are good for you, the meditations take discipline. Even so, some of the strategies are kind of fun: "Imagine the people in your life as tiny infants and as 100-year-old adults." The trouble is, once you start, it's hard to stop.